HHL Leipzig Graduate School of Management cordially invites to a Leipzig Leadership Lecture on May 17, 2019 at 5 pm. Former German Chancellor Gerhard Schröder speaks on current economic and political issues and issues that move us in Europe. The afterwards discussion with the audience will be moderated by Prof. Dr. Andreas Pinkwart, Minister of State for Economics, Innovation, Digitization and Energy of the State of North Rhine-Westphalia.The event is in German. 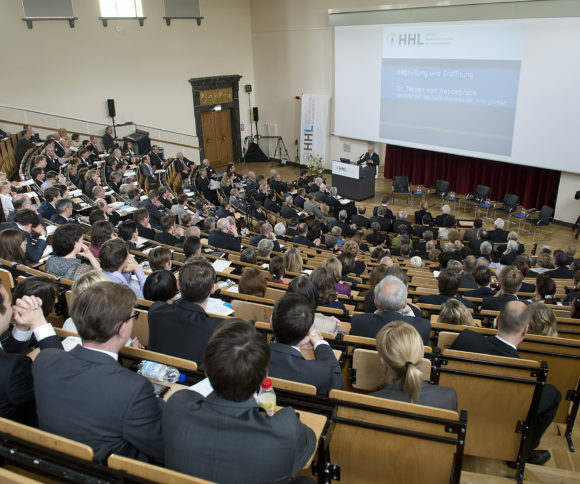 The Leipzig Leadership Lecture is a series of talks that brought representatives from politics and business to HHL since 2013. The events are open to anyone interested and invite the audience to discuss about leadership culture and experiences with professional leadership. Past guest speakers include René Obermann, at that time Chairman of the Executive Board of Deutsche Telekom AG. Andreas Dombret, at that time member of the board of the Deutsche Bundesbank, Götz Werner, founder of the drugstore chain dm, and Timotheus Höttges, CEO of Deutsche Telekom AG. The event will take place on Friday, May 17, 2019, from 5.00 to 7.00 pm in the Great Lecture hall on HHL Campus. Please register for the event on Eventbrite by April 30 the latest. The seats are limited and for safety reasons participation is only possible after prior registration.